Ambitious tidal energy developer, Oceanflow Energy Limited, has attracted a £300,000 package of support to further develop and commercialise its second generation tidal energy device, Evopod. The company, which has been supported by Scottish Enterprise through its WATERS scheme, has developed and patented a technology to generate electricity from tidal streams and ocean currents. Its product, the Evopod, is a buoyant tethered platform that supports one or more horizontal axis turbines. REIF has joined the latest funding round for Oceanflow which comprises private investors to help support the commercialisation of the product which is soon to be tested as a quarter scale (35kW) demonstrator at Sanda Sound off the coast of South Kintyre. "We would like to thank the Scottish Investment Bank for supporting the deployment of our first E35 unit which has been built in Scotland and is soon to be installed at our grid connected test site in Sanda Sound. Our Evopod device employs innovative technology and the REIF funding, together with new private investment, will accelerate the demonstration of this technology. Sanda Sound can be a harsh environment and it will be a good test of our technology for the eventual deployment of larger output units at sites in areas such as the Pentland Firth." "Supporting development of Scotland's marine energy sector is a key priority area for Scottish Enterprise and that's why through our range of investment funds, including REIF, we continue to invest in Scotland's most ambitious and exciting marine energy projects. Oceanflow represents the cutting edge of this new emerging industry and we are pleased to be able to invest alongside others to support development, test and demonstration of exciting new technologies in Scottish waters." Scotland's wave and tidal sector is estimated be worth up to £1 billion to the Scottish economy by 2020. More than 25 wave and tidal energy device companies are currently actively developing, testing and demonstrating devices in Scottish waters – more than anywhere else in the world. The company's objective is the continued development and commercialisation of Evopod, an innovative device for generating electricity from tidal streams, ocean currents and rivers that could drive down the cost of energy through reduced installation and maintenance costs. Evopod is a semi-submerged, floating, tethered energy capture device. It uses a mooring and power export solution that allows the free floating device to maintain optimum heading into the direction of flow of the tidal stream. 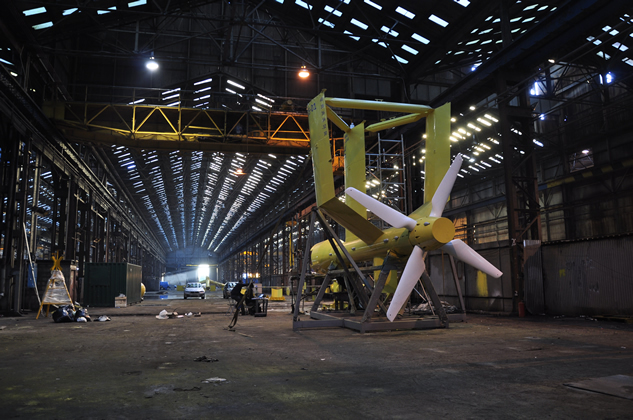 In March 2011 the 1kW Evopod unit achieved the first successful power export from a floating tidal turbine. Oceanflow's current development is a 1/4 scale Evopod which follows the successful operational experience of our 1/10th scale project in Strangford Narrows, Northern Ireland. The 1/4 scale project consists of an Evopod with a rated output of 37kW which will be connected into the 11kV grid at Southend, South Kintyre. In January 2013 Oceanflow's Scottish subsidiary Oceanflow Development Limited signed a Lease with The Crown Estate for the site in Sanda Sound which provides the opportunity for demonstrating its technology in an environment of 20m water depth and up to 4.5 knots flow speed which approximates to ¼ scale Pentland Firth. Oceanflow has developed its technology with the support of private investors in the UK and Norway together with European grants administered by development agencies in Scotland and North East England. The latest funding round consists of UK private investors with Scottish Enterprise as a co-investor through the REIF fund.